Roelof Frankot was a Dutch painter and photographer from Meppel. Frankot initially started his career as a photographer, but tended more towards painting in 1930 at age 19. His works, mainly oil paintings on canvas, show a strong resemblance with those of the CoBrA artists, being abstract, lively and strongly coloured. Frankot was featured in numerous exhibitions througout Europe, the United... Read moreRoelof Frankot was a Dutch painter and photographer from Meppel. Frankot initially started his career as a photographer, but tended more towards painting in 1930 at age 19. 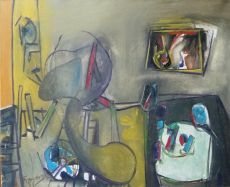 His works, mainly oil paintings on canvas, show a strong resemblance with those of the CoBrA artists, being abstract, lively and strongly coloured.